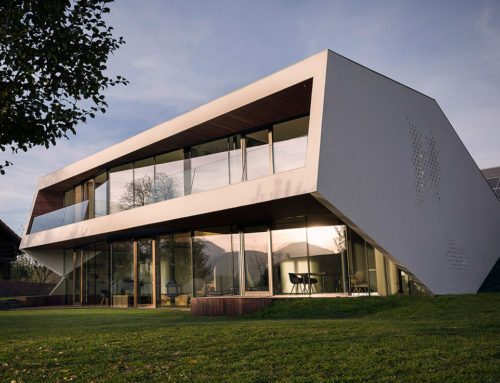 This project was realised in Rakovica (Sarajevo), in the area dominated by family weekend houses. The main idea was to sublimate the residential heritage from both Bosnia and Herzegovina in terms of the house forms, materials and function. The Author conducted an analysis of the traditional house forms and created a modern composition that rests on the autochthonous vernacular architecture. With this in mind, the Author opted for stone and wood application to achieve this effect. There are two ground-floor units connected by an interior corridor and cladded with natural stone. 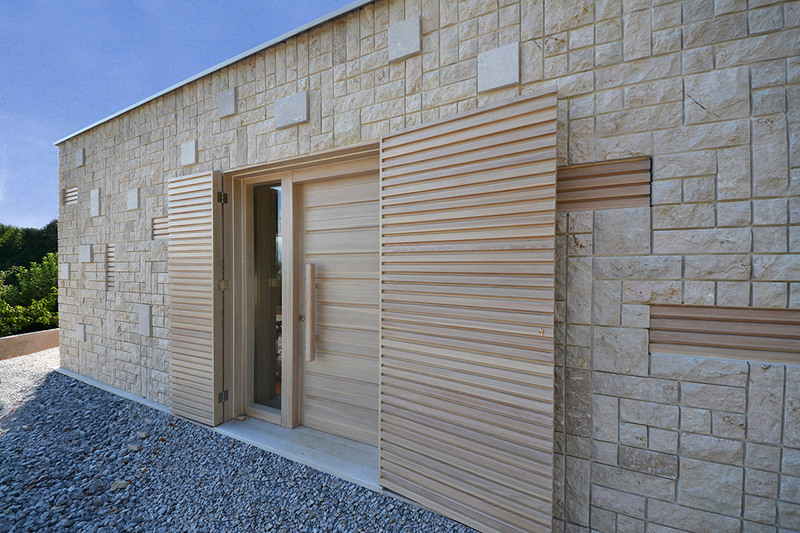 The first unit, approached via sloped pedestrian ramp, is a square-shaped 8.8×8.8m form, cladded with natural stone – hresa in combination with wooden decorative elements on all four sides. Tondach plain clay tiles are used for roofing, and the roof peak is 6.14m high. The other unit is almost square-shaped with dimensions of 8.3×9.3. 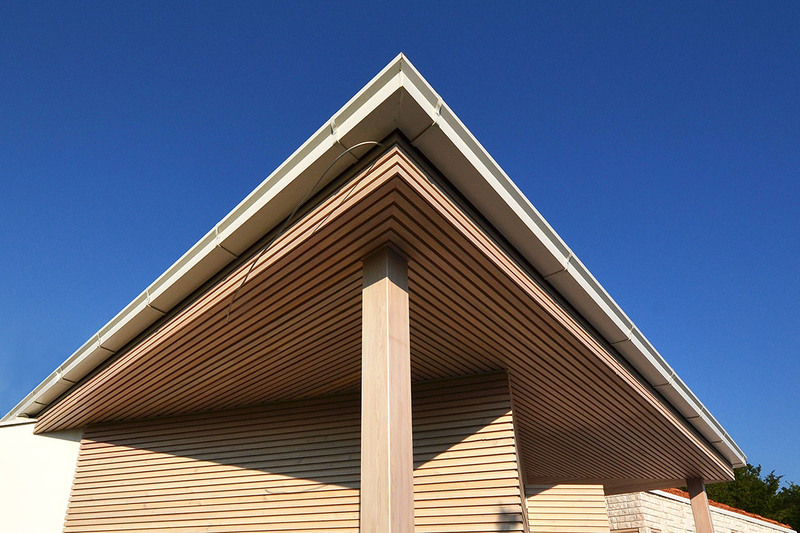 It has a plain white façade combined with white wood – the Siberian larch. The highest point of this structure is 6.55m. Both volumes together make one physical structure with two separate zones, public and private. The first zone is an open-floor space, with a living room, dining room and a kitchen, directly connected with the exterior on three sides. The private zone comprises three bedrooms and a bathroom. Outdoor swimming pool (8x4m and 150cm deep) is right next to the house on its southern side. There is also an outdoor summer kitchen on the eastern side of the house with a sitting area. The one-level plan of the house fits perfectly into the natural surroundings, without disturbing it. The total net usable area is 120.2m2, while the gross area of the house is 153.0m2. As it was already mentioned, the house has only one level with total dimensions of 11.6m x 19.6m. The materials used in construction are all of the cutting-edge technology, including Profi Wienerberger Porotherm blocks, Tondach Biber roof tiles and stone wool in the cladded façade. In the end, this resulted in a highly insulated envelope with high level of water vapour iffusion, minimum energy needs for heating and cooling and minimum emission of CO2. The house A is cladded with autochthonous stone – hresa, applied in a unique manner, i.e. a specially designed pattern with seven different sizes of stone elements. All of this indicates how much effort was invested by both the architect and other project participants to create this piece of architecture.